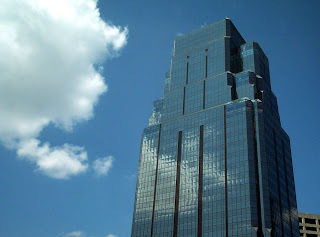 Designed as a tribute to Kansas City Missouri’s City Hall, One Kansas City Place was constructed in 1988, and completed on the 50th anniversary of City Hall’s opening. The postmodern skyscraper, with its glass and blue curtain wall façade, is located just five blocks west of City Hall. It stands 623.75 feet tall and has 42 floors. The tower was designed by Frank Morgan, whose uncle had designed Kansas City’s Town Pavilion. Standing 591 feet and 38 stories tall, the Town Pavilion was the tallest building in Missouri for two years prior to the completion of One Kansas City Place. A blue and green lighted sign at the top of the tower reads “KCP&L” for Kansas City Power & Light, the company occupying twelve stories of the building. Other businesses with offices in the tower include Bank of America, Karkbank Real Estate Company, accounting firm Ernst & Young, and law firm Bryan Cave. Lights at the top of the building shine red, white and blue for most of the year. They are changed to recognize Christmas, Breast Cancer Awareness Month, St. Patrick’s Day, Valentine’s Day, and for important Chiefs and Royals games. Missouri is also home to the St. Louis Gateway Arch, a monument to westward expansion, which stands 630 feet tall. The arch has two sets of 1,076 emergency stairs and is the tallest man-made monument in the United States. I don't know how I am going to get authorization to run the stairs in this one but I will try hard to make it happen. While it isn’t technically a building, the Gateway Arch in St. Louis Missouri is the tallest structure in the state. 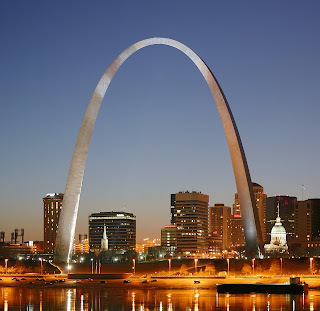 Created as a monument to westward expansion, the arch stands 630 feet tall. There is no larger man-made monument in the country. The arch was designed by Eero Saarinen and Hannskarl Bandel. It was completed in 1967 after four years of construction. The monument is made of stainless steel and is as wide as it is tall. There is a set of 1,076 emergency stairs located within each leg of the monument. The Gateway Arch is illuminated in a white glow every night from 10pm to 1am.